The mobility scooter and the wheelchair are two of the useful medical inventions that are of enormous help to both the handicapped and the elderly. A tandem innovation for these medical equipment is the lift, which can easily bring up electric powered mobility devices (mobility scooter and wheelchairs) on a vehicle's floor. A mobility scooter or wheelchair lift can be dismantled and can be easily stored, making it good paraphernalia for enabling a weak or disabled individual a ride into an automobile and at the same time allowing the scooter or wheelchair to be transported inside a vehicle. (1) Those that can be placed inside the automobile or internal. (2) Those that must stay outside the automobile or external. The type of scooter/wheelchair vehicle lift may depend on certain factors, such as the mobility equipment that would be carried and how the lift would be stored. Internal lifts, or also referred to as inside vehicle lifts, are obviously the type of lifts that you can place inside the vehicle. 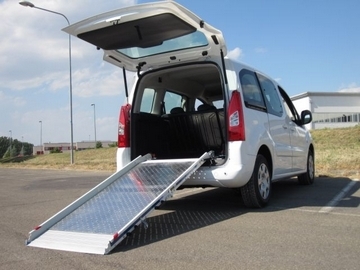 Such type of scooter/wheelchair lifts may be supplied with either manual or electric power. Some vans already have built-in lifts for the passenger's scooter/wheelchair. A large space in the vehicle's back or compartment must be taken into consideration when choosing an internal lift to ensure that both the mobility equipment and its corresponding lift will be accommodated. One primary advantage of internal lifts is that you do not have to worry about weather conditions because your mobility aid is safe, protected, and dry inside the vehicle. The second major type of vehicle lift is one installed on the outside of the vehicle, usually at the back. External vehicle lifts must be strong enough to carry the mobility scooter and wheelchair all throughout the travel. External automobile lifts have platforms that tilt back for you to wheel the scooter or wheelchair to have it carried by the car or van. Some external automobile lifts are designed like an elevator where you veer in your mobility device into a platform and will easily and securely raise the wheelchair on the level of the vehicle's floor or just a few inches above the floor or ground. Such vehicle lift may expose your mobility device to adverse weather condition like rain or snow. This can cause possible damage. However, there is really no need to worry because covers are available to protect your scooter/wheelchair. External lifts are also foldable and can be securely attached at the back of the vehicle. Choosing the most suitable vehicle lift in terms of function and comfort depends on several factors, such as features, operation, and installation of particular lifts. Some have hand-held control buttons and devices, as well as alerts and warnings to identify unsafe conditions. Not all features should be added though, so choose only those that are importantly functional. Different lift models may vary with some specifications, hence asking reliable professionals or manufacturers about the details of the product is recommended. Basic knowledge and information regarding these vehicle lifts (both internal and external) will help you purchase the best mobility scooter or wheelchair lift for your vehicle type.